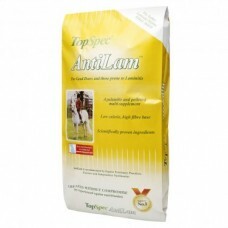 Top Spec Anti Lam is a palatable, pelleted product. It contains several supplements combined with a high-fibre, low calorie feed. It is specifically designed for Good-Doers and those susceptible to, and recovering from, laminitis. Top Spec Anti Lam contains: High fibre oat by product, grass meal, Linseed Expeller, vitamin mineral premix, unmolassed beet pulp, cane molasses, calcium carbonate, dicalcium phosphate, wheatfeed, sodium chloride, magnesium oxide.